Born December 7, 1925 to James Sr. and Edith Lairy. Graduated from Cadott High School. Married to Donald Lee on January 8, 1944. Barbara worked in many night clubs in the area. Always had big gardens and loved picking berries. Made homemade bread and lots of pies which was she shared with family and friends. She loved spending time with her family and playing card games with them. Barbara loved dancing and was a reader of a great many books. She loved watching the Packers and the Brewers. 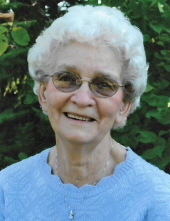 She was a member of the Holy Cross Catholic Church in Cornell and the PCCW for many years. She is survived by her children Betty (Gerald) Britton of Boring, OR, John (Karlene) Lee of Holcombe, WI, Daniel (Mag) Lee of Spooner, WI, and Patty (Rick) VanDommelen of Spooner, WI, 16 Grandchildren, 36 Great Grandchildren and 3 Great-Great Grandchildren along with 3 step Grandchildren and 5 step Great Grandchildren and many Nieces and Nephews. Preceded in death by her parents. Her husband and son Gerald both in 2000. Also, a brother James Jr. in 1986 and a brother Robert and a granddaughter both in infancy. To send flowers or a remembrance gift to the family of Barbara J. Lee, please visit our Tribute Store. "Email Address" would like to share the life celebration of Barbara J. Lee. Click on the "link" to go to share a favorite memory or leave a condolence message for the family.